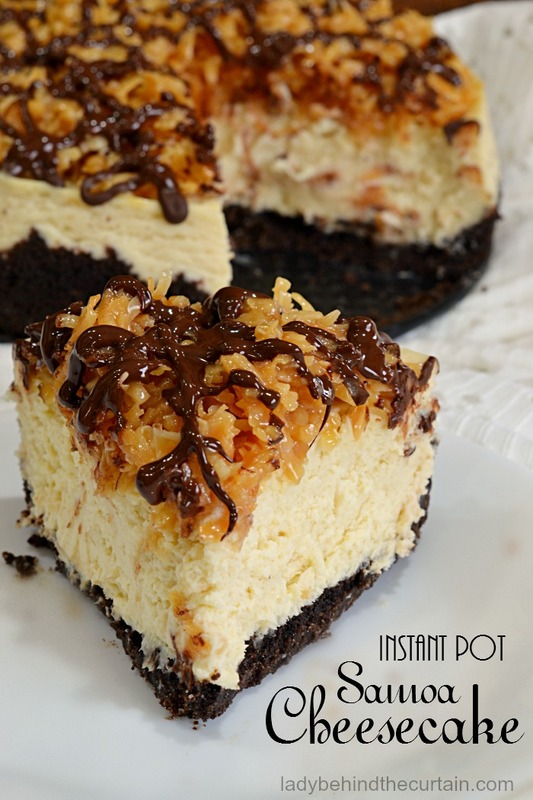 Instant Pot Samoa Cheesecake | Inspired by your favorite Girl Scout cookie “Caramel DeLites”. 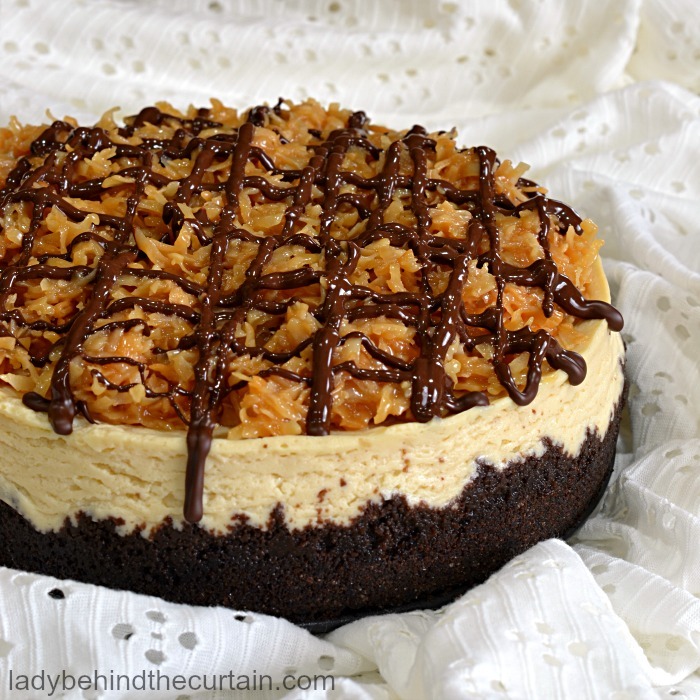 This vanilla based cheesecake has a chocolate crust with a simple to make caramel coconut topping and a drizzle of chocolate. It doesn’t get any better than that. But wait it does! I baked it in my Instant Pot (pressure cooker)! I love how creamy this cheesecake bakes. You might ask why a pressure cooker and not just bake it in the oven? My opinion on that is the pressure cooker doesn’t bake like an oven with dry heat, it steams the cheesecake which in return delivers a creamy cheesecake free of cracks. 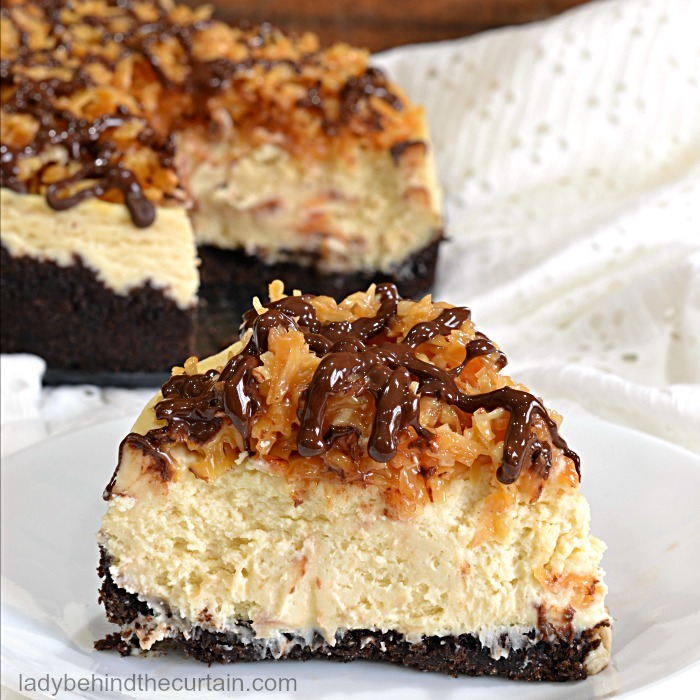 When it comes to cheesecake it’s hard to beat a Samoa Cheesecake. There’s not much history to be found about the reason a coconut topped concoction was named Samoa. I like to think it’s because of how happy the people are from the South Pacific Samoan Islands. And Samoa anything makes me happy! Maybe it’s because when the Girl Scout bakers created this wonder treat the bakers gave their cookie that name because it kind of sounded like “some more”, as in, “Give me some more of those delicious coconut thingies.” Since S’more was already taken they went with Samoa. For whatever reason this name was created you can’t deny that the taste is knock your socks off GOOD! 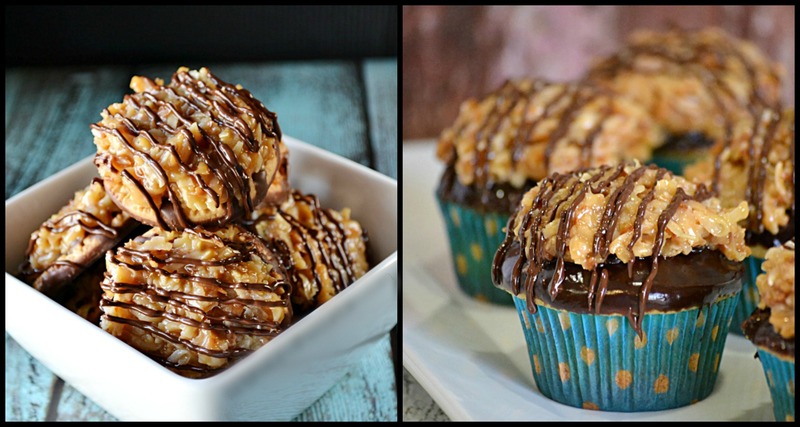 If Samoa recipes is what you love you might want to try these recipes. SEMI HOMEMADE SAMOAS COOKIES AND SAMOAS CUPCAKES. 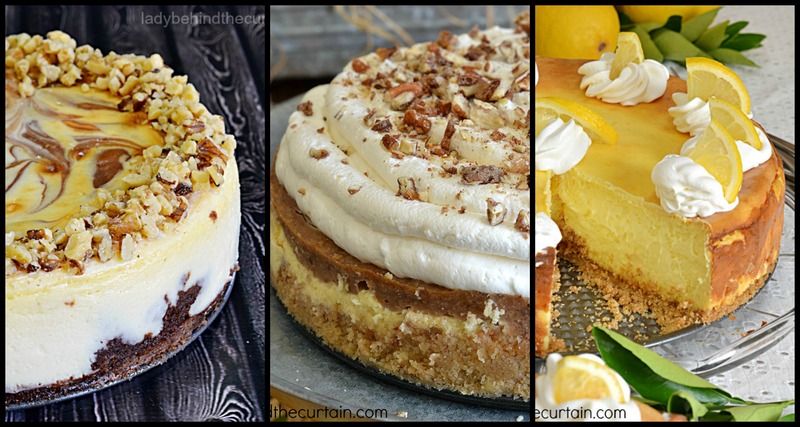 READY TO CREATE THE BEST CHEESECAKE YOU’LL EVER HAVE? So the cheesecake will fit in the Instant Pot you’ll need a 7-inch springform pan. I found mine on Amazon—->>>>Hiware 7-inch non stick springform pan. 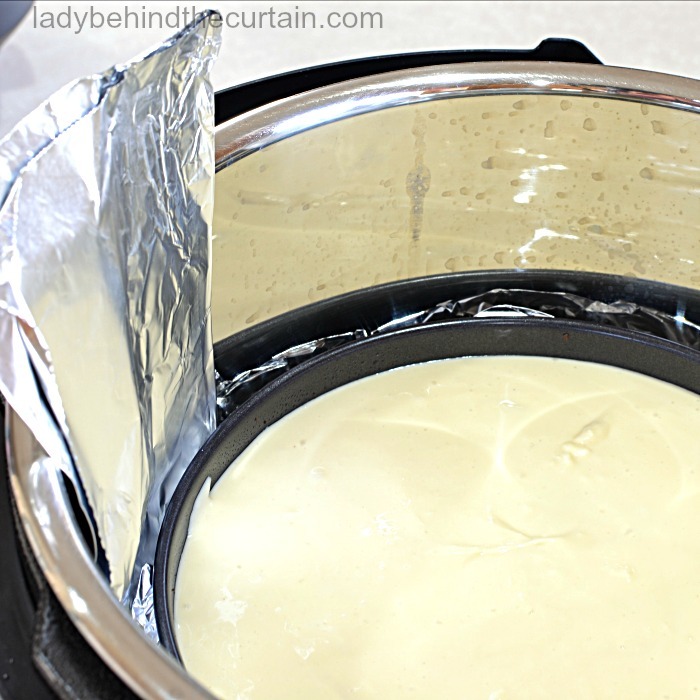 You can also bake cakes with this pan in your Instant Pot Pressure Cooker. Wrap the pan in foil. Make a “sling” with foil (see directions in recipe). 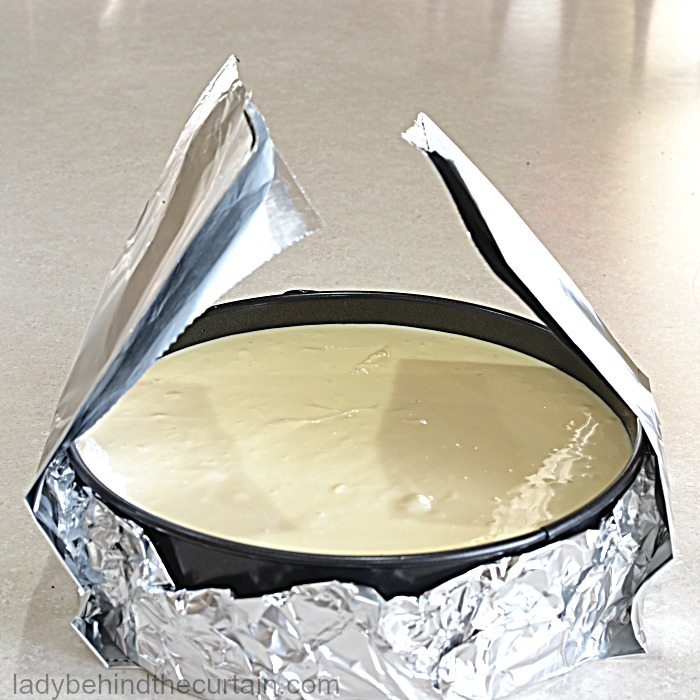 Use the sling to lower the cheesecake into the cooker. 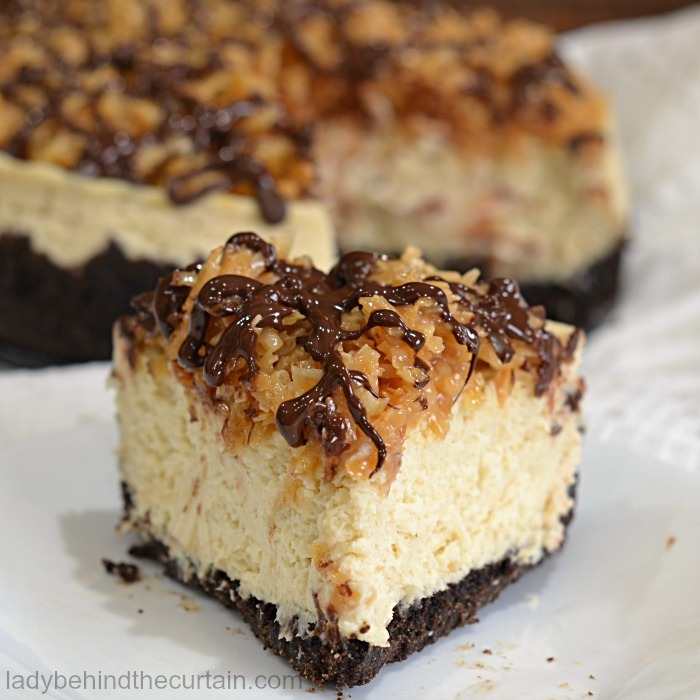 Cheesecake bakes with non cracks! Spray a 7-inch springform pan with non stick cooking spray. In a medium bowl, mix together the chocolate crackers, sugar and butter. Pour into prepared pan; press up the sides (about 1-inch) and the bottom. Place in the freezer while the filling is being made. In a medium mixing bowl add the cream cheese, granulated sugar and brown sugar. Whip until the ingredients are combined and creamy. Add the sour cream, flour, vanilla and eggs to the cream cheese mixture. Beat on medium until all ingredients are combined and creamy. Take the pan out of the freezer; pour filling over crust. Place pan in the center of a piece of foil; bring up the sides and cover but do not extend above the rim. Take another piece of foil (about 18-inches long), fold into thirds long wise. This strip will serve as a sling and make lifting the cheesecake out of the pot easier. Set the cheesecake in the center of the strip. Pour 2 cups water into the bottom of the Instant pot; place the rack that came with the pot in the bottom with the handles folded on top. Using the sling lower the cheesecake into the pot. Place the lid on top and secure. Plug in the pot, press manual and set cooking time for 30 minutes on high pressure. Once the timer goes off use the quick release for the pressure. 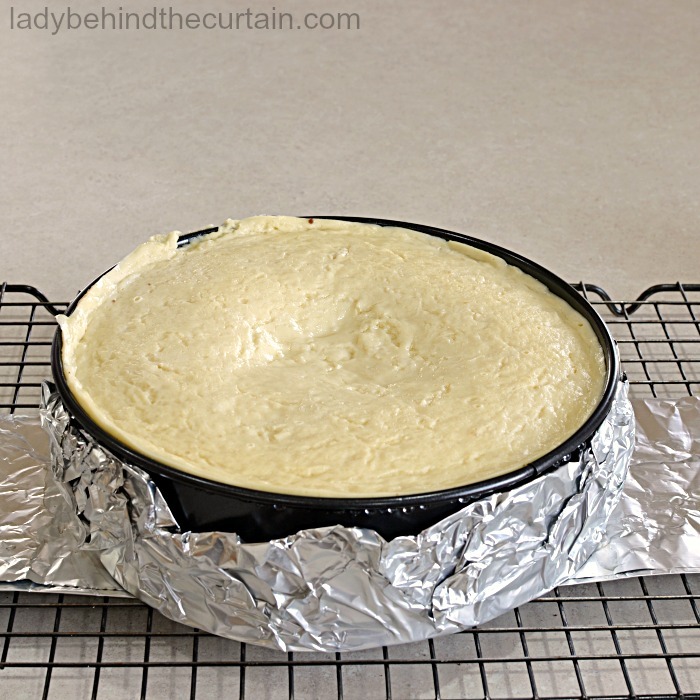 Lift cheesecake out of the pan and onto a wire cooling rack. NOTE: There might be some liquid that accumulated in the center of the cheesecake during the cooking process. If so, use a paper towel to soak up the liquid. Cover with foil and cool completely in refrigerator (at least 4 hours). Spread coconut on a rimmed baking sheet and toast 20 minutes, stirring every 5 minutes, until coconut is golden. Cool on baking sheet. Unwrap the caramels and place in a large microwave safe bowl with cream. Cook on high 1 ½ to 2 minutes, stopping to stir a few times. When smooth stir in toasted coconut. Spoon coconut mixture on top of cheesecake. In a microwave safe bowl melt chocolate chips. Pour chocolate into a zip top bag, snip the corner and drizzle over cheesecake. If you don't plan on the serving the cheesecake as soon as the topping is added; I recommend at least pre-slicing it and storing the cheesecake covered in the refrigerator. ONE HOUR before serving take the cheesecake out of the refrigerator. The time may vary depending on room temperature. Don't let the inner temperature of the cheesecake get any lower than 41°. This is the highest temp you want your cheesecake to reach. At the one hour mark I was easily able to put a fork through the topping to eat. I still recommend slicing the cheesecake while the topping is warm. This cheesecake is SO fluffy!!!! It is Jennifer! I love how creamy a cheesecake is after baking in an instant pot! Thanks Becca, I love how creamy cheesecake turns out in an Instant Pot. Your cheesecake looks delicious, but do you have a alternative recipe for baking this traditionally. Would love to make this for my family. Hi Dar, I don’t….not yet anyway. I plan on doing that soon. What make is your instant put please? Can you use it for all cheesecakes as well? Many thanks. It looks delicious. Hi Patricia, My Instant Pot is a 7-in-1 Pressure Cooker 6 qt. This was my first cheesecake in the instant pot. I would say yes, any cheesecake will work. Wondering how far ahead of time you can make this? I am hosting a party and making a couple of IP recipes and will be sharing about IP with ladies coming. Hi Wanda, I think you can make it at least two days before you want to serve the cheesecake. I would hold off adding the topping until the day of your party. My cheesecake wasn’t cooked all the way through.. I’m not sure what I could have done wrong. Will try again. Hi Sara, Make sure you added enough water to the bottom. The Instant Pot needs at least 1½ cups of liquid to pressurize. I had two cups of water in the pot. My cheesecake was very thick Perhaps I need to adjust the time and allow it to release pressure naturally? Maybe altitude (I’m at a mile high) has something to do with cooking times. I checked after suggested time and it still wasn’t set. I went far another 3 minutes but I’m thinking 5 or 6 would have been perfect. But the taste is amazing! Great recipe! Great advice Ronnie! Thanks for the help. Can I substitute the caramel candy for just caramel sauce? Or will it alter the flavor? Sure Maya, The flavor of the wrapped caramels is a little richer then the ice cream topping. 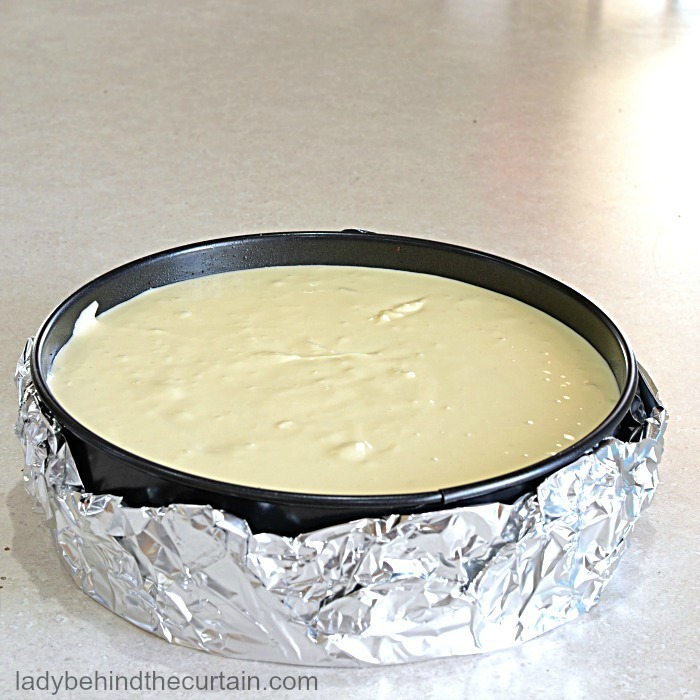 Some cheesecake recipes say to put a paper towel over the filling then cover that with foil while cooking. Do you not cover yours with anything? Does the top get covered with condensation if you don’t? Hi Debbie, I didn’t cover mine. It did have some moisture on the top. I just dabbed it up with a paper towel. Do I need to use the foil if I have a silicone trivet with handles? If the handles reach to the top of the pot then you’re fine. I could only get a 6 inch pan since the 7 is sold out. Do I need to make any changes to the recipe? Thanks! Hi Dee, I would recommend you going ahead and making the full recipe. You may not use all the batter but there’s really no way to adjust it that small. Only fill the batter to 1-inch from the top of your pan. I would also adjust the crust a little. I hope this helps. I’ve made cheese cake in the oven and freeze it. Can your cheese cake be frozen? Hi David, Sure! This is just like any other cheesecake. Hi Laura, I love that pan! I’ve never used one but it says it’s for cheesecake, so I think it will work. WooHoo Kelly! I’m so glad you love the recipe as much as I do! Remind me of Girls’ Scout Cookies! Need to make it! Why would I wrap foil around the pan? I understand the sling to help to lower and lift up the pan but wrap around. Hi Sheri, It helps keep the moisture or water from seeping into the pan. Why would a foil be wrapped around the pan? Can this be made in the oven?? Sure Lee….you might have to adjust the baking time compared to a full size cheesecake.